There were some very nasty pot holes here, especially right in front of the bus stop on the right. There is a natural spring apparently (I am told its not just a leak) just behind where the Temporary Road Surface sign is so there is always running water on this section which combined with the freezing temperatures we have been having just destroys the road surface here. Well for now at least its a smooth ride through this section! I will try and catch up with the links over the coming weekend as I have not been on the computer much this evening! Glad to see that's been done - that part of Keswick Crescent was absolutely dreadful! Alexandra Road was done early last year, that really did need doing. It amazes me though how many residents from Woodford quite rightfully complain to PCC about the state of the roads in Woodford, yet nothing's been done about it! St Margarets Road has a nasty few though none are anywhere near as bad as Crossway - I'll take some photos when I can. Mudge Way & St Mary's Bridge are also deteoriating rapidly, as is Dunnet Road in Southway though that may have been done. Apparently the Council have no money to resurface roads, yet have £7m to waste on a failing football company...? Beyond me. These are just two right at the bottom of Crossway I quickly took about 2 months ago and have just found them on my SD card - these are only two right at the bottom and are by no means the worst - there's plenty more! > "There is a natural spring apparently"
Surely the council is missing out on a brilliant money-spinner here. Eau d'Estover anyone? 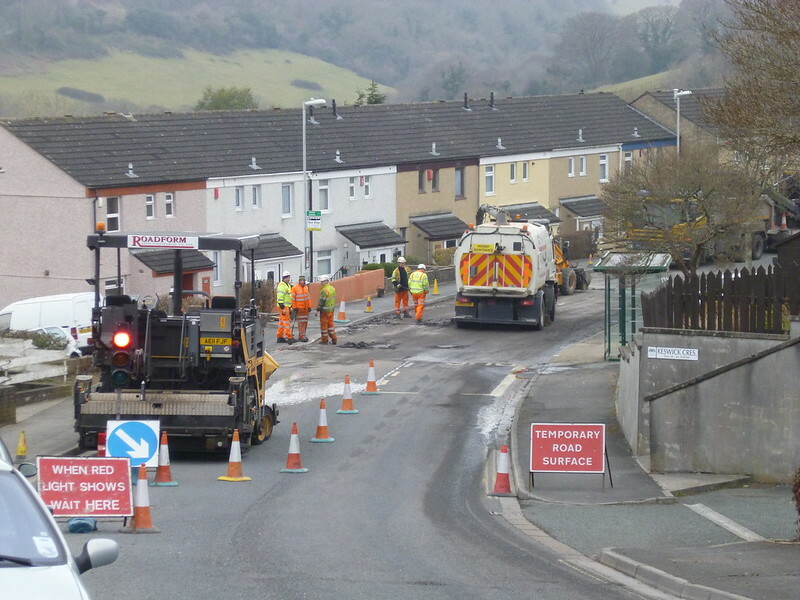 Remember the big "you've been upgraded" hoo-ha when the council trumpeted about resurfacing a lot of the poor roads? Well now they're all as bad as they were before the 'upgrade'.